Fader configuration: 16-fader left section, 8-fader Centralogic section, 8-fader right section, 2-fader master section . 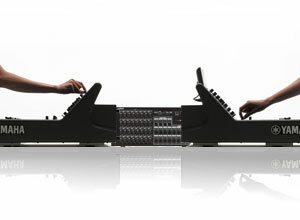 Clear visual continuity from the Centralogic section’s physical faders to virtual on-screen controls via the console’s elegantly curved panel matches the unambiguous directness of analog console channel modules. 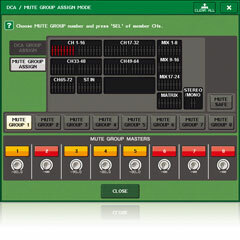 Any of the console’s input and output channels can be instantly assigned to the Centralogic section in 8-channel groups. 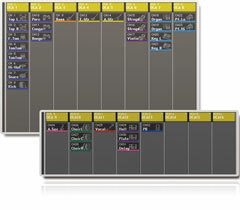 The Selected Channel display provides a comprehensive view of the many controls and functions available for the currently selected channel. The corresponding physical controllers to the left of the display are labeled and laid out in the same way as the on-screen controls, for confident access and operation. The CL series includes a number of refinements to this now-standard interface for unprecedented operating ease. The way CL series functions and controls work together is a perfect example of how a whole can be greater than the sum of its parts. 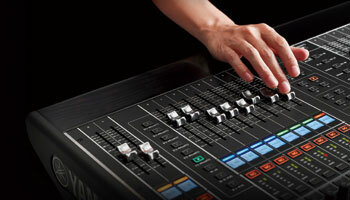 Within the larger framework of the user interface, the visibility, feel, and precision of individual faders, knobs, and switches are an essential part of the overall operating experience. The visual flow of the control layout across the consoles’ sweeping curves makes a significant contribution to smooth operation as well. 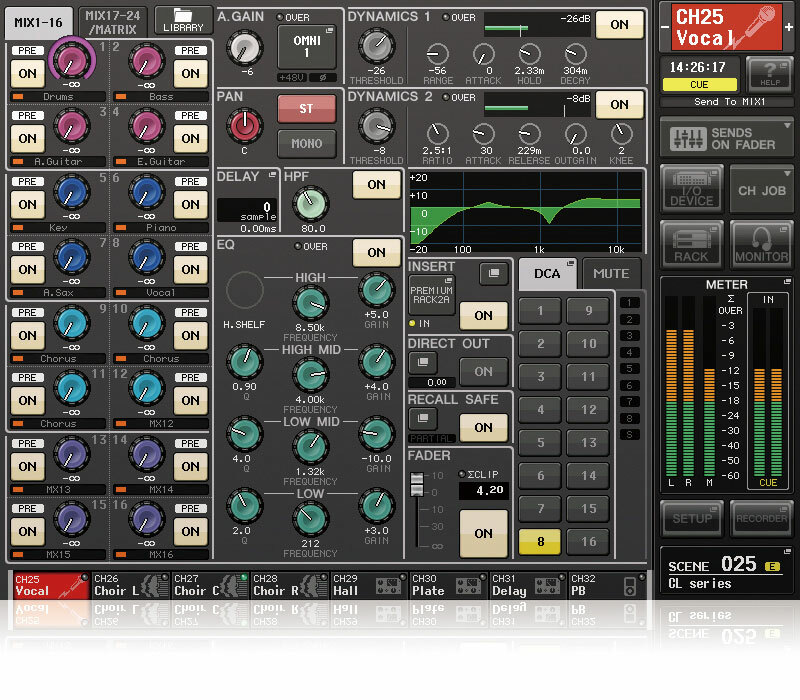 The outstanding balance of the entire system, plus refinements such as programmable channel names/colors and user defined knobs, add up to operation that is, in a word, sublime. No detail of form or function has been overlooked, right down to how the curvature of the elegant fader knobs comfortably fit the fingers at any angle. 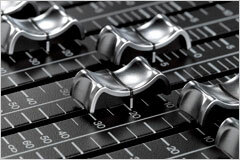 The fader knobs even have non-slip inserts that provide ideal friction for smooth, slip-free fades. Visibility is important too, so the knob edges are sculpted to provide a clear view of the fader scale from just about any angle. 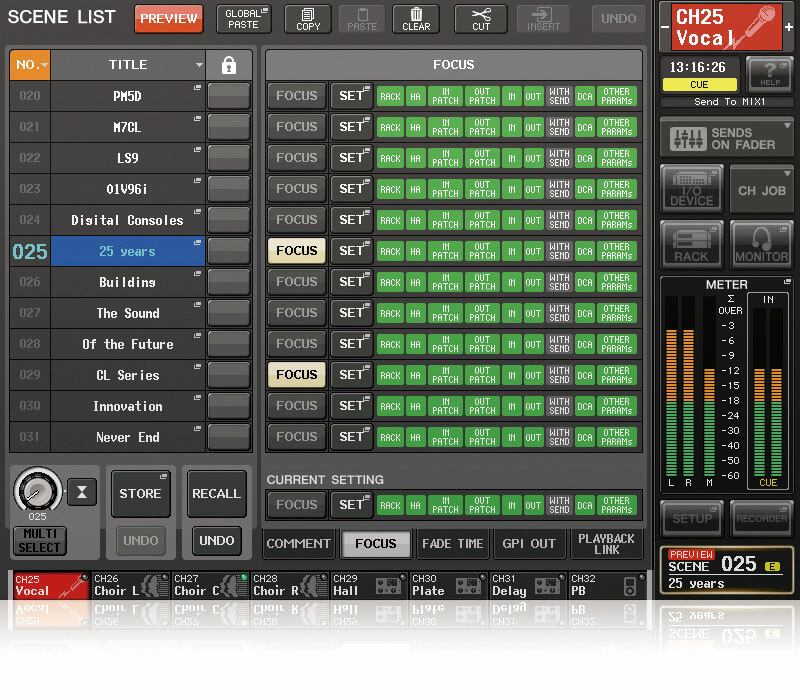 Editable channel name displays above each fader automatically switch to a larger character size for short names, and show pan and fader values as well. Below each channel name display is a color bar that illuminates in any of eight selectable colors, the same as those used in the central touch screen, for at-a-glance channel and group identification. Brightness can be adjusted for optimum visibility under any ambient lighting conditions. 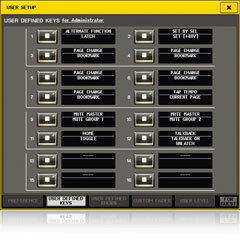 The User Defined Keys provided on Yamaha digital consoles are already a standard. 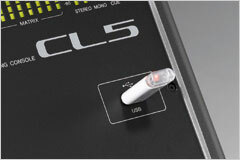 The User Defined Knobs provided on the CL series consoles will quickly achieve the same status. Just about any of the console’s variable parameters can be assigned to the four User Defined Knobs for direct, instant access. Another advanced control feature is Custom Fader Bank selection, allowing the faders in each section to be instantly reordered as required. The sweeping form of the CL consoles is not only elegant, but it provides the best possible view of all controls and displays from the operator's position. 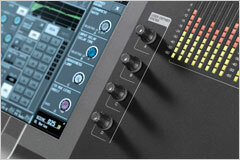 The visual continuity from the Centralogic faders to the display is seamless. The hand rest is genuine oak with a gorgeous finish that matches the visual and tactile sophistication of the overall design. Network capabilities are rapidly becoming fundamental and indispensable in today’s fast-paced world of digital live sound. CL series consoles feature separate console and I/O rack components that communicate via the Dante™ network audio protocol, allowing fast, efficient design and deployment of capable systems from the most basic to the dazzlingly complex. The ability to add Lake® processing via expansion slots also adds to the system’s versatility and adaptability to the widest range of mixing needs. The complexity and variety of today’s live sound systems makes fast, adaptable configuration and setup capability vital. Of course the highest level of sonic performance must be maintained at the same time. 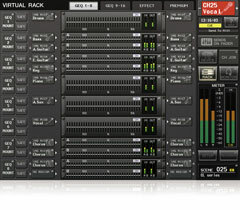 CL series consoles use the Dante network protocol developed by Audinate to allow flexible connection to multiple I/O rack units configured and located according to the needs of the application, while at the same time providing redundancy for superior reliability. 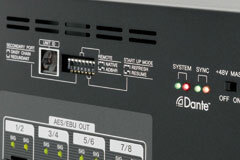 Dante directly supports star network configurations, so up to eight I/O rack units can be connected to any single CL series console and conveniently located wherever they are needed most. A few simple DIP switch settings are all that is required to change to daisy-chain networking as required. The ability to set up even complex systems quickly and easily is another benefit of Dante networking. In most cases devices on the network are recognized and set up automatically. And since patching operations that usually require a separate computer can be carried out directly from the CL console, changes to the initial setup are painless as well. 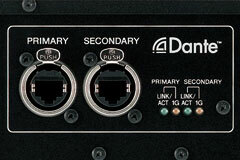 Dante also makes it easy to maximize system reliability. Star networks allow the use of redundant primary and secondary lines for each device, for the utmost reliability in critical applications. With this type of setup a malfunction in a cable or other network component won’t bring the whole system down. The show will go on. Here's a case where Dante offers not only extended system flexibility, but enhanced operability as well. 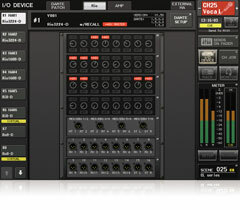 NEXO NXAMP discovery and patching operations that normally require a computer running the Dante Controller software application can now be carried out directly from the CL console touch screen display when the NXDT104 Dante network card is installed. * CL firmware version 1.5 or higher required. Multiple CL series consoles can share control of the same I/O rack unit, allowing unprecedented system flexibility and efficient use of system resources. 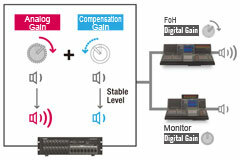 A new Gain Compensation function adds the ability to combine FOH and monitor control via a single network, for comprehensive digital live sound integration. 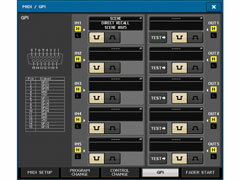 One obvious drawback of connecting multiple consoles to a single I/O rack unit is that gain adjustments made from one console can cause unexpected gain changes at the other consoles. 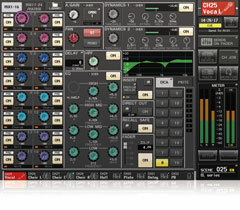 The Gain Compensation function implemented in the CL consoles ensures that when the analog gain stage is adjusted from one of the consoles, corresponding compensation is automatically applied at the digital stage so that the level sent from the I/O rack unit to the connected CL consoles remains constant. Gain compensation applied after any initial analog gain levels are set is carried out entirely in the digital domain. Digital gain control is another original CL series feature that contributes to extraordinarily smooth, efficient operation and integration of the entire system. 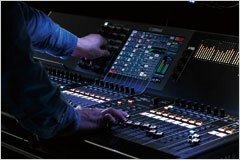 The quality and variety of internal effects have become major factors in choosing a digital live sound console. Studio quality sound is a must, but so is having the right processors for the job at hand. CL series consoles feature virtual effect racks that are packed with a selection of effects that have been chosen and developed to meet the real-world needs of live sound professionals. 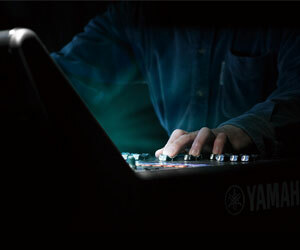 Everything you need to create perfectly polished sound for your application is right here. 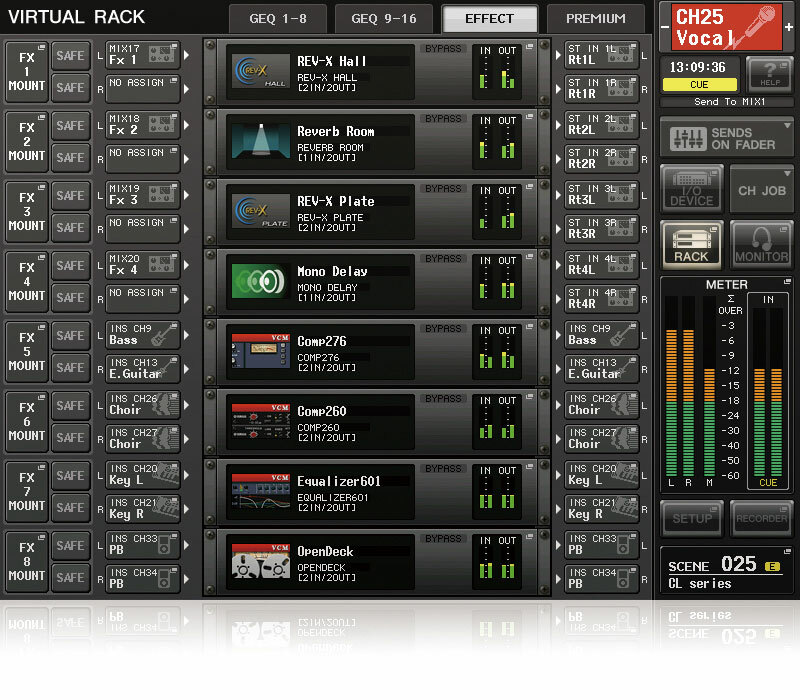 As the name implies, “virtual racks” provided in the CL series consoles let you combine signal processors you need for your application in one easily accessible location, much like traditional analog outboard racks. The new CL series Premium Rack can accommodate up to eight instances of the six expressive EQ and dynamics effects provided, including the Rupert Neve Designs Portico 5033 equalizer and Portico 5043 compressor/limiter. The ability to use some of the most highly regarded studio effects in live mixes can help you deliver unprecedented sonic quality in any venue. In addition to the Premium Rack described above, the CL consoles feature an Effect Rack that allows simultaneous use of up to 8 effects from a selection of 46 ambience effects and 8 insertion effects, all of outstanding quality. 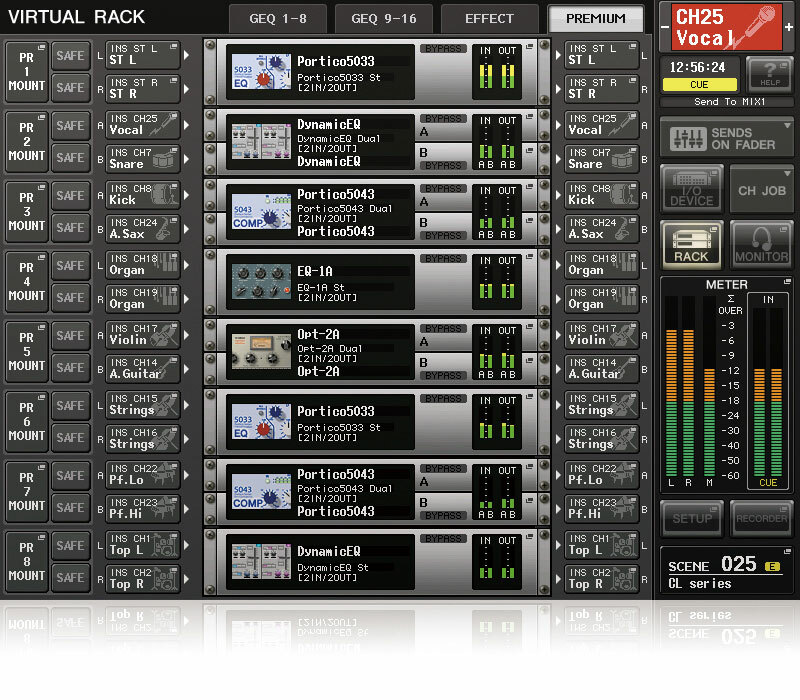 Although a separate EQ rack is provided for the output buses, any of the 8 effects in the Effect Rack can be replaced by graphic EQ units as needed. 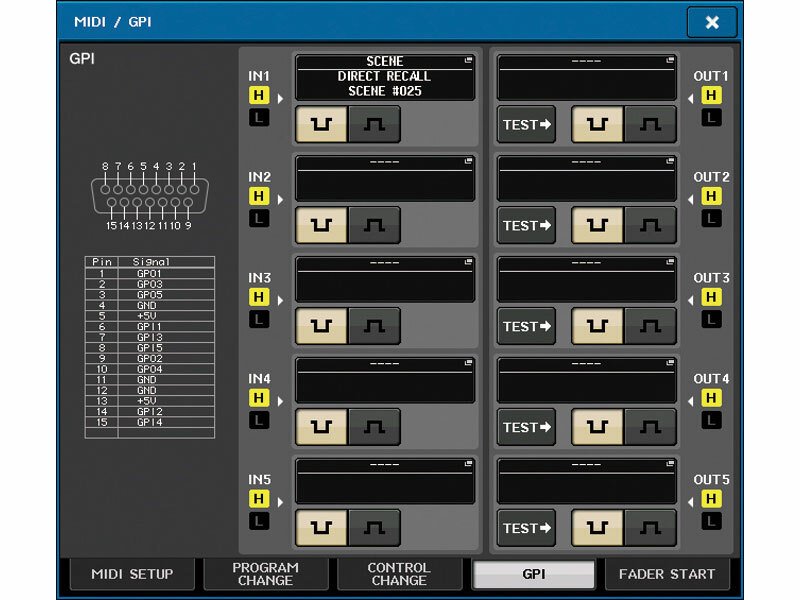 The CL consoles also feature a GEQ rack that allows graphic EQ to be inserted into the output buses as required for room equalization and other functions. 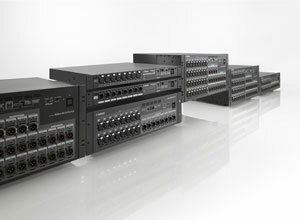 Up to 16 31-band GEQ units can be mounted in the rack for simultaneous use, and those GEQ units can be individually switched to Flex15GEQ mode, effectively providing two EQ channels that allow up to 15 bands to be used at a time. 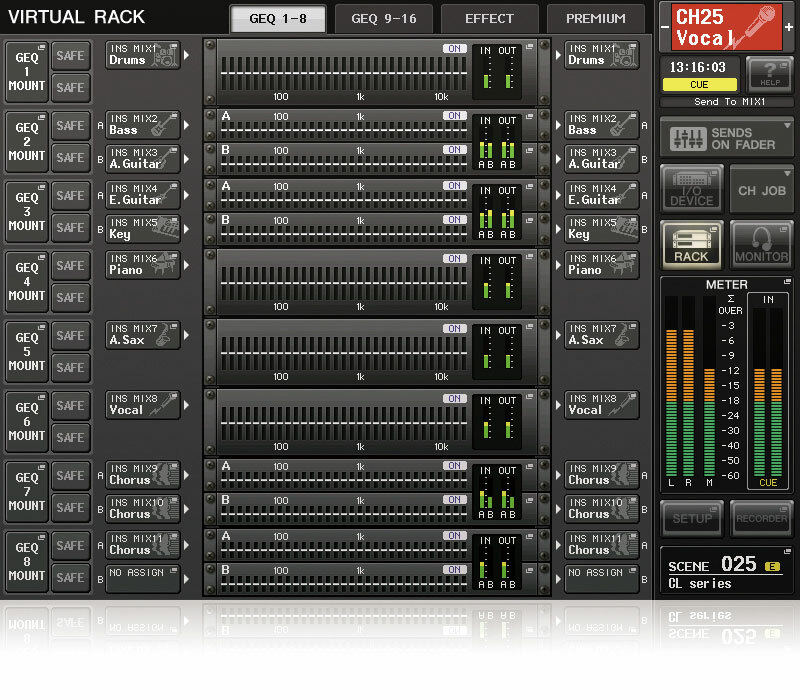 With a full rack of GEQ units all functioning in Flex15GEQ mode, you have a total of 32 GEQ channels for extensive equalization capacity. VCM technology delivers refined, musical tonality in the outstanding lineup of devices provided in the CL series Premium Rack and Effect Rack. These devices immaculately model the full sonic depth and breadth of the original analog equalizer and compressor/limiter modules by Rupert Neve. They are not only ideal for adding first-class studio-quality processor sound to your mix, but are also remarkably easy to set up for optimum effect. Merely inserting these outstanding models in the signal path can enhance the sound. 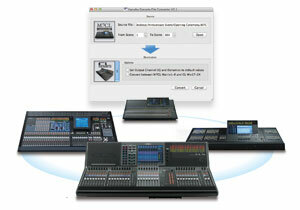 A studio standard that is ideal for a wide range of applications. It even features a RATIO “ALL” button that simulates the effect of engaging all of the ratio buttons on the original. This is a model of one of the most widely used optical studio compressors from the 1960’s. The distinctive and highly regarded compression and release characteristics of the original are recreated with remarkable precision. The classic studio equalizer that is the basis for this model is still in demand today, highly prized for the musical response of its vacuum tube and transformer EQ circuitry, as well as its distinctive boost/cut characteristics. This original EQ module detects level variations in specified frequency bands in real time, dynamically adjusting EQ gain to provide pinpoint compression, limiting, and de-essing. A refined interface contributes to fast, easy operation. This model is a composite of several analog compressors that were popular in recording studios in the 70’s. Anyone who is familiar with the originals will recognize the characteristic punch and fatness this device delivers. Here’s a unique effect that models both the analog circuitry of well-known professional tape decks plus the characteristics of the tape used with them. You can simply choose a deck that offers the sound you need, or combine different recording and playback decks for a range of useful variations. The compressor/limiter modeled in this device was all the rage in the late 70’s, featuring solid-state RMS level detection circuitry and VCAs for level control. The sonic signature of this model is unmistakable. 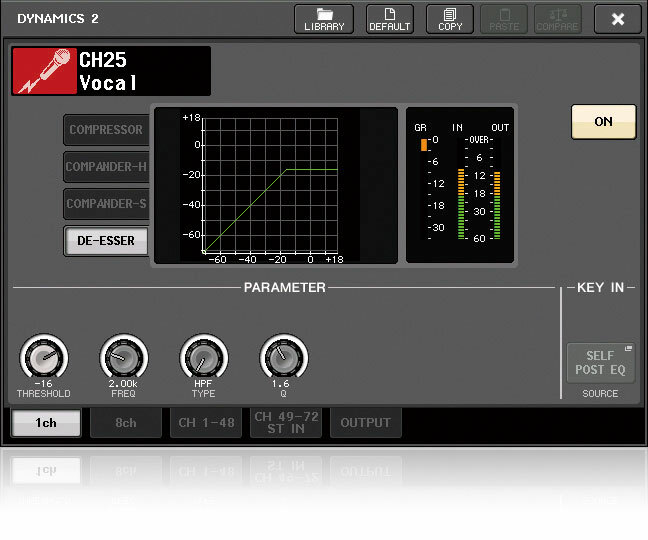 For a sweet analog EQ sound, this model recreates a popular circuit topology from the 70’s. 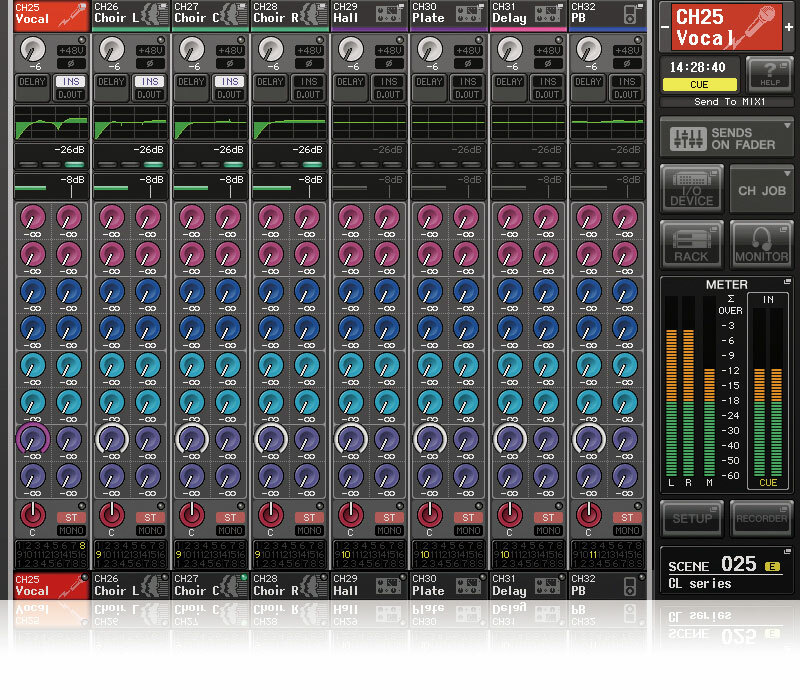 CL series consoles offer two live recording solutions: convenient 2-track recording direct to USB memory, and high-performance multitrack recording to a digital audio workstation via Dante. 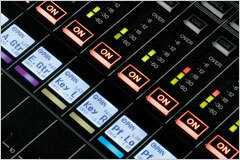 Whether it’s for a simple web upload, a commercial release, or just material to be used for a virtual sound check the next day, you have all the recording capability you need. 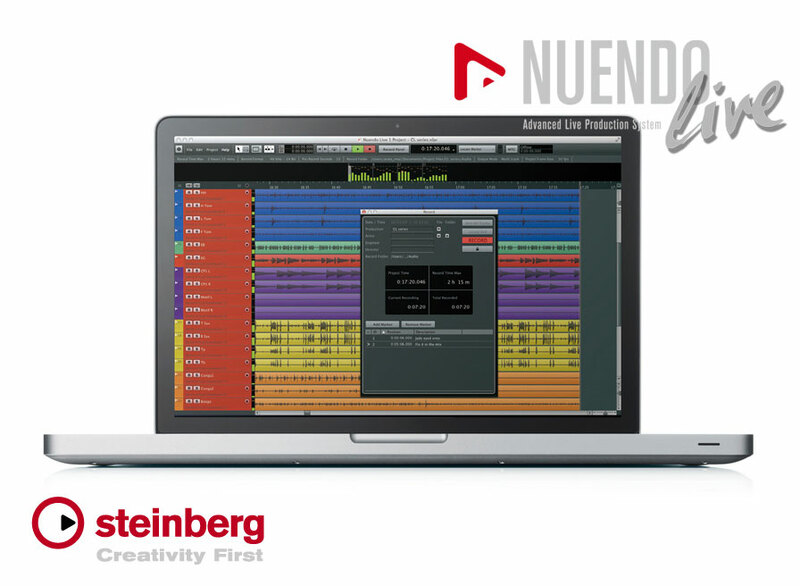 The Nuendo Live DAW application has been specifically designed for live multitrack recording, providing comprehensive control and overview for smooth operation under the most demanding live situations. 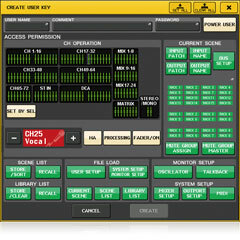 An extension plug-in provides seamless integration with CL console features, such as channel names, markers, transport control, and more. 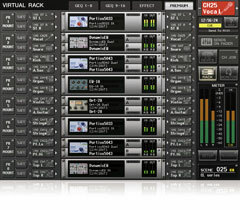 Dante Virtual SoundcardDante Virtual Soundcard software, included with CL consoles and Rio3224-D/Rio1608-D I/O racks, enables direct multitrack recording to a Windows or Mac based DAW without the need for an audio interface between the console and computer. 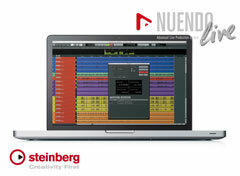 A high-performance DAW application such as Steinberg Nuendo Live can be used to record up to 64 tracks with studio quality and editing capabilities. 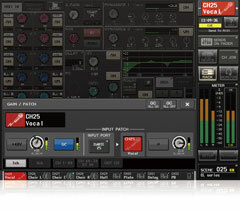 DAW playback can be instantly patched to the CL console’s input channels so that multitrack recordings can be used for “virtual” sound checks when the performers aren’t available. Recordings of the previous day’s performance can be used for sound check on the following day! More information about Nuendo Live. 2-track recording in mp3 format couldn’t be easier. 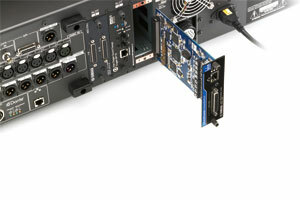 Simply plug a USB memory into the USB connector on the front panel of the console and start recording. No other equipment is required. Of course playback from the USB memory is possible as well, making it a convenient source for BGM or sound effects. 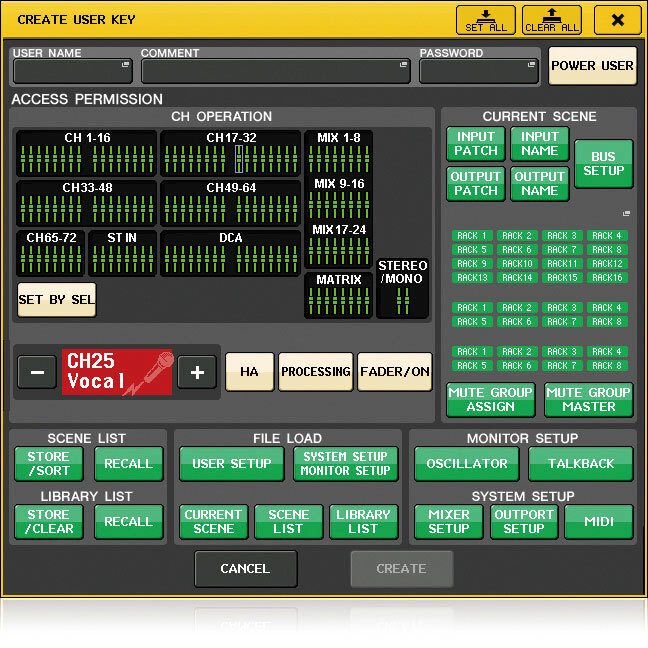 Three Mini-YGDAI card slots on the CL consoles provide easy I/O expansion as well as extra processing capabilities. New additions to the expansion card lineup include an MY8-LAKE card that integrates Lake Processing, a staple in today’s live sound field, into the console, and a Dugan-MY16 card that adds the most advanced automated microphone cueing and gain control available. 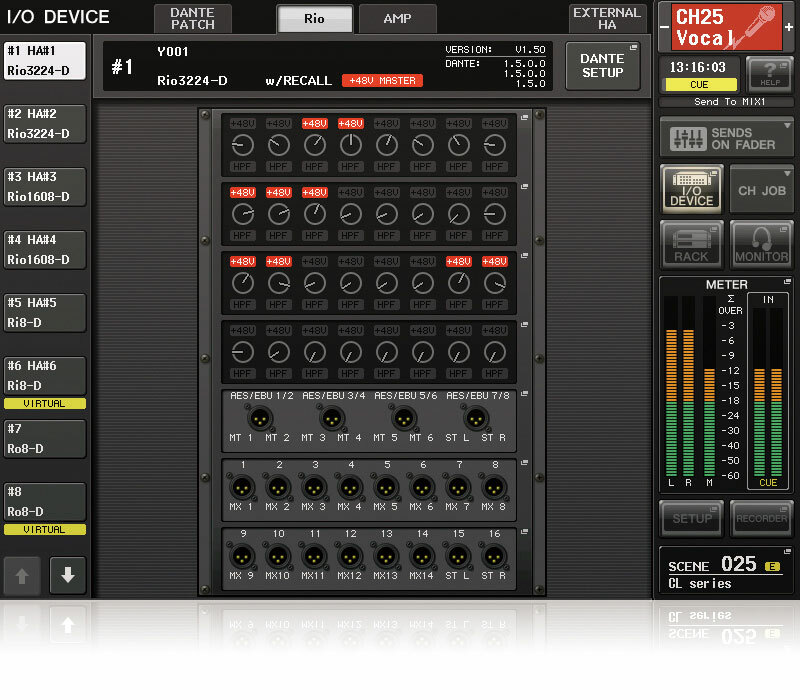 With the CL StageMix application, an iPad becomes a wireless remote controller that can be used to set up and operate CL consoles from anywhere on stage or in the audience seating area. There’s even a built-in iPad stay on the CL5 and CL3 panels, providing a convenient mount for an iPad to be used for additional control functionality. There’s also the CL Editor application for computers running Windows or Mac operating systems, for both extended online operation and offline setup and editing. In addition to full Selected Channel and Overview display operation, the CL Editor facilitates scene data management, patch list editing, channel name editing, and much more. 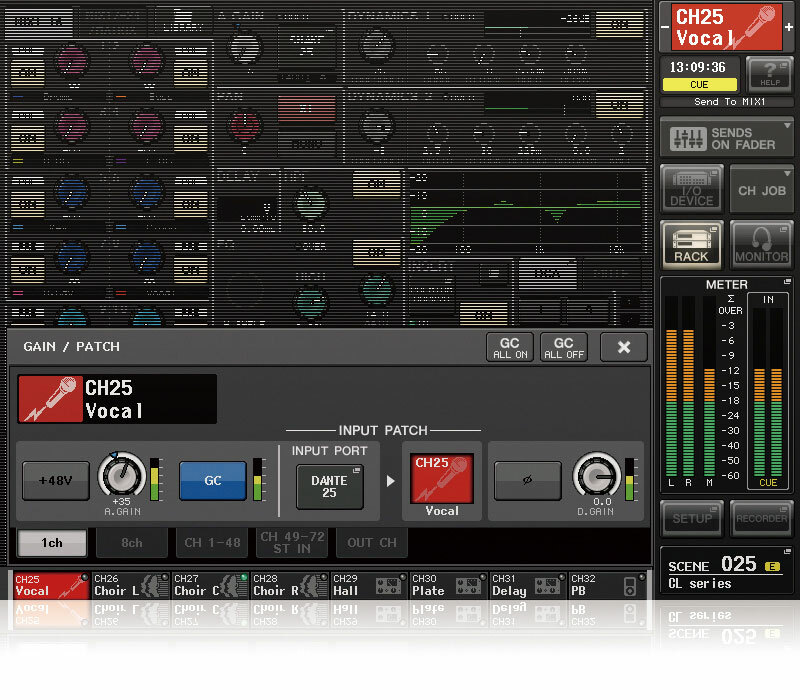 It’s even possible to use the CL StageMix and CL Editor applications at the same time. More information about CL StageMix. Lake processing has become a standard for loudspeaker processing in live sound applications. An alliance between Yamaha and Lab.gruppen brings Lake Processing right into the CL series mixing consoles, via the MY8-LAKE expansion card. The MY8-LAKE card provides 8-in/8-out in Mesa (system EQ), 4-in/12-out Contour (crossover), and 4-in/4-out and 2-in/6-out Mesa & Contour (combination) modes. Although primarily intended for speaker processing, the asymmetrical Mesa EQ can also be very useful on input sources. 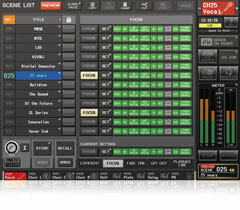 The Lake Controller application running on a compatible computer allows management of multiple Lake devices in the system, while close compatibility with Smaart® contributes to smooth, efficient speaker system tuning. The Dugan-MY16 automatic mixer card, developed in cooperation with Dan Dugan Sound Design, provides smoothly automated microphone cueing and gain control for up to 16 input channels. Rather than using gates to open and close channels, the Dugan system uses gain sharing and fades for smooth, natural level changes. 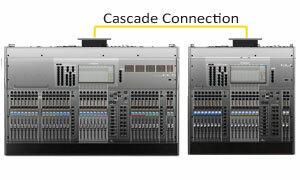 For applications that require a large number of input channels, CL consoles can be cascade-connected via I/O cards such as the MY16-AE installed in their Mini-YGDAI expansion card slots. 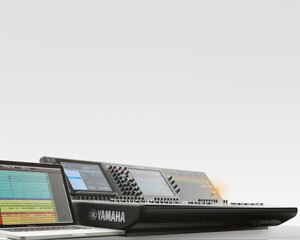 The Yamaha Console File Converter is an application that allows data to be shared between a number of Yamaha digital mixing consoles, and the CL series consoles are included in the latest version. You can share data between CL series, PM5D, M7CL, and LS9 consoles, so data from one show doesn't have to be completely reprogrammed from scratch for the next, even if different consoles are used. 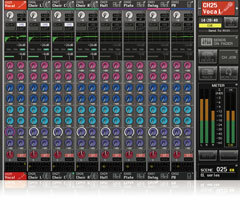 Although there are as many ways to use a mixing console as there are sound engineers, extensive feedback from professionals in every possible sector of the business has made it possible to provide a feature set that is ideally suited to the real-world needs of demanding live sound applications. Up to 300 complete console setups can be stored as “scenes” and instantly recalled whenever needed. Recall Safe, Focus, and Preview functions are also provided. Up to 1000 ms delay on input channels facilitates precise microphone phase compensation, while up to 1000 ms delay on the output ports is useful for speaker distance compensation and room tuning. 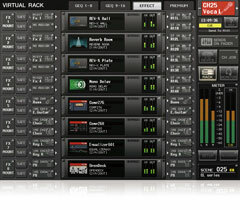 All channels feature 4-band parametric EQ and two dynamics processors (one dynamic processor on outputs). The processors include an HPF for every input, and one also functions as a highly effective de-esser with advanced processing algorithms that also offers a bandpass mode. 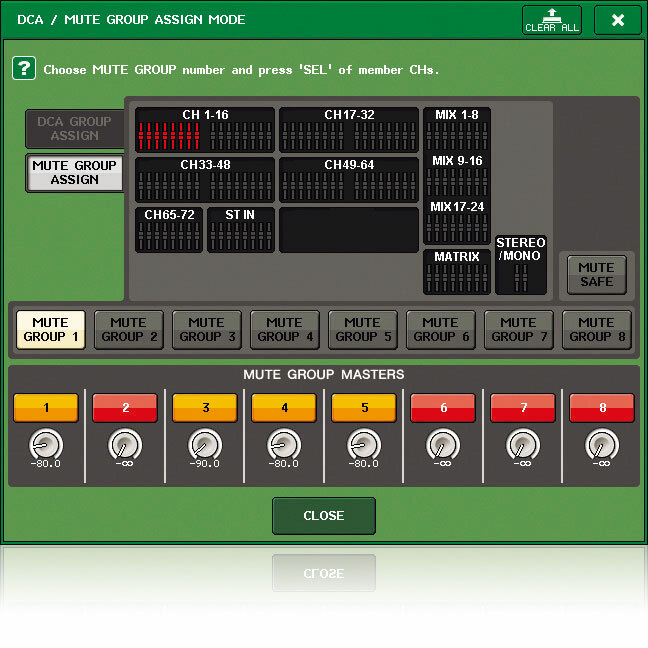 16 DCA groups allow flexible grouping of multiple input channels for simultaneous control. Multiple channels can be assigned to any of 8 mute groups for instant muting or un-muting, with a new Dimmer Level function. 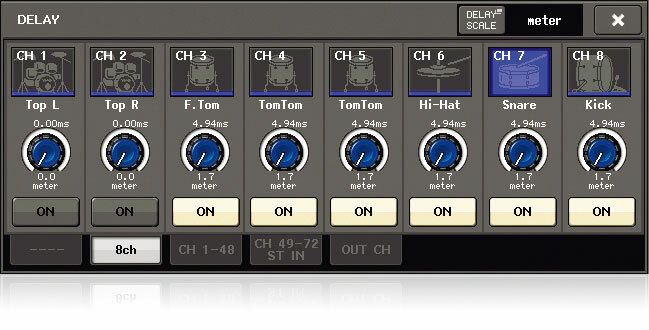 A large number of console functions including Sends on Fader, Tap Tempo, and Set by Sel can be assigned to 16 User Defined Keys for instant hands-on access. 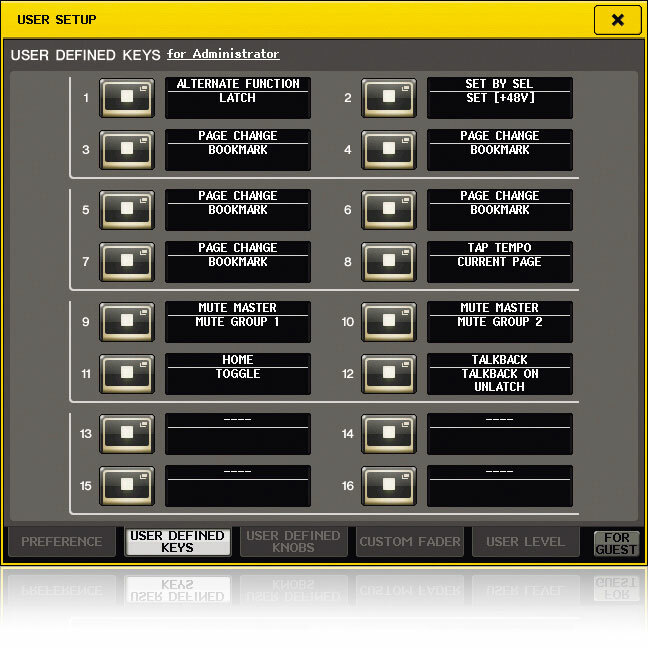 Limited access to CL console functions can be provided for less experienced operators and accident prevention via multiple User Key sets that can be stored in the console itself as well as on USB memory. A 5-input/5-output GPI interface allows the CL consoles to respond to input from external switches, as well as to transmit on/off status to external devices. Simply tap the on-screen “Help” button to access the onboard operation manual. Once loaded all essential information is available directly via the console’s display, so you won’t need to keep the printed manual with you.